Revolution for dogs over 6 weeks of age helps stops the scratching, chewing and shaking with an easy topical once-a-month preventive treatment which kills adult fleas, flea eggs and flea larvae in the environment and controls flea allergy dermatitis, prevents heartworm disease heartworm, treats and controls ear mites ear mites, hookworm and roundworm, treats and controls sarcoptic mange and is non-greasy and waterfast only 2 hours after application. Choose an area where licking cannot occur e.g. on the back of the neck. Part the coat until the skin is visible. Place the tip of the tube on the skin and squeeze several times to empty the contents directly onto the skin. Revolution can be used in puppies from 6 weeks of age or older. Do not use in sick, debilitated or underweight animals. Safety Information Dogs should be tested "Adult Heartworm Clear" before giving this medication. 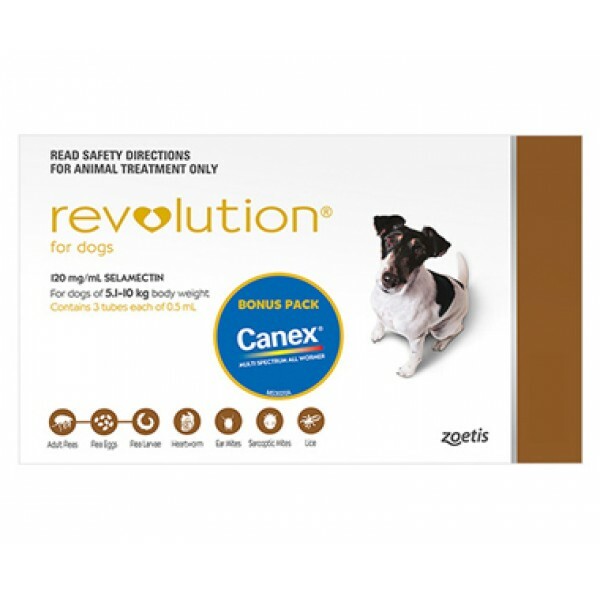 Revolution can be used in puppies and kittens from 6 weeks of age or older. Do not use in sick, debilitated or underweight animals.